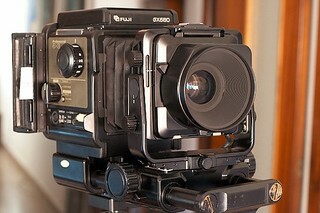 The GX680 is in a series of medium format SLR studio system cameras that uses 120/220 roll film in a 6x8 format and introduced by Fuji in 1986. It was replaced by the GX680 II in 1995. A third revision was released in December 1997 as the GX680 III. The system was officially discontinued in April 2010. It is designed for portrait, and product photography. The right hand side of the body has the shutter speed dial, film wind button, along with a transport mode switch that controls single, continuous, multiple / instant film exposure modes. The bottom part has a remote release socket, mirror control, sync test, and shutter release. The left of the camera body has the battery holder and battery unlock switch. The front standard has release knobs for rise/fall, tilt, shift and a swing lever. The camera is powered by a rechargeable 7.2 volt NiCad battery. A optional battery holder for using LR6/AA batteries was offered, but somewhat hard to find as it was not available in all regions during launch. Since many used this as a studio camera an AC adapter was also available. An optional strap kit was offered with the camera, as it does not have standardized slots or lugs for a strap. The system uses interchangeable lenses with bellows type focusing. The standard bellows can be interchanged with either a wide angle or close up versions. The lenses are mounted on a electronic lens board type system which allows for movements on the front standard similar to view cameras. 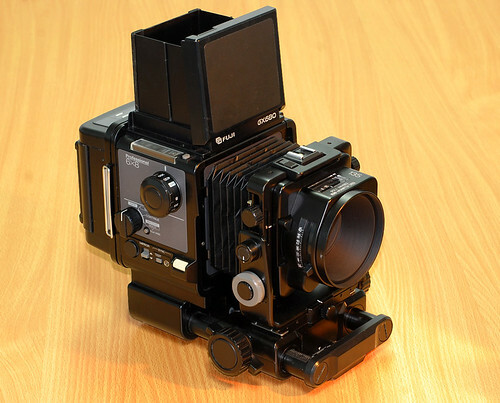 The front sits on a rail that connects to the main camera body, two knobs on either side control the focusing. The standard lens is a EBC Fujinon GX 135mm f/5.6. A 82mm filter thread is standardized for the system. The shutter is electronically controlled and located within the lens. It has speeds of 8 seconds to 1/400 of a sec plus a bulb mode. The lenses have controls for aperture and a depth of field preview lever. The cocking of the shutter is automatic. Flash sync is at all speeds and can be connected to the camera's PC socket on the right hand side of the body or to the hot shoe on the front standard. It uses interchangeable, removable film holders mounted on a rotating back. Film is loaded onto inserts. The film transport is motorized with a automatic film loading system. This allows automatic advance of film, as well as film loading without exact alignment of the start indicator. It is capable of traveling at approx 1 fps. A chime alerts when reaching the last frame. To protect against loosing exposures when changing holders it uses a interlocking dark slide system. A dark slide holder is built into the back. The film speed can be set from 25 to 1600 ISO in 1/3 increments. The film holder is powered by a 3.6v lithium ½AA sized battery. This battery is used when the holder is detached from the body. Replacement of this battery is a bit difficult but not impossible, and sending it off to Fuji was recommended as it requires soldering. A memo holder is on the back as a reminder of the type of film loaded. The viewing system can use interchangeable finders as well as focusing screens. The standard screen has a matte surface with a microprism center. The standard finder is a folding waist level type. It has a magnifier with 2.5x magnification and interchangeable with various diopters. AE finders are available with a built-in exposure meter. It provides aperture priority TTL metering. A orientation indicator is visible in the finder when the rotating back is in the horizontal position. The GX680 II is a newer revision released in 1995. It is nearly identical to the original and is often difficult to tell the difference. A few notable changes include a auto masking finder. This feature mask the finder based on the rotation of the film back. The lens locking system on the front standard has been redesigned. 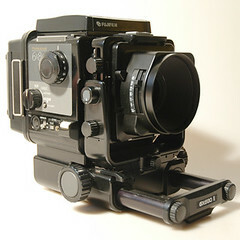 It uses the same film holder as the original GX680, but additional holders that support other frame options such as 6x6 and 6x7 can also be used. A GX680S model was also available, it does not have any movements knobs on the front standard. The GX680 III is the third and final revision released in December, 1997. The body materials have changed and the design has undergone a bit of a face lift. The changes result in a much lighter body compared to the previous models. This model also has the ability to be carried with the inclusion of mount points for a camera strap. The battery has been changed from the rechargeable NiCad batteries of the first two bodies to three lithium CR123A batteries fitted to the base of the camera. A 6x AA battery pack was also offered and can be used along side the lithium. When the AA battery pack is attached to the side of the body the lithium batteries do not consume power. The interchangeable back system has changed to a new film holder III N. It allows installation of mask for using 6x45, 6x6 and 6x7 formats. The film can also automatically wind without attaching to the camera body. The ISO range has also been expanded to 25 to 3200 ISO. Battery changes for the new holder are much easier and user friendly. They accept two CR2 batteries. The holder also allows exposure information to be imprinted onto the edge of the film. This back can also be installed on previous GX680's but imprinting will not function and frame counting may not be accurate with format masks. A GX680 IIIS version was also offered at the same time as the III. It is identical to the regular III but does not have any movements knobs on the front standard (rise, fall, tilt, shift, swing) but the basic bellows focusing system is still the same. With this feature removed the camera has also decreased in weight. 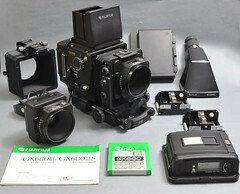 The Fujifilm Digital Camera Back or DBP is a digital sensor used for the GX680 system. It was available in Japan in 2004 and discontinued at the end of 2006. The camera back is based on Fujifilm's Super CCD sensor. It is capable of producing images with a resolution of 7648 x 5408 on a 52mm x 37mm sized sensor. Images can be captured in 50, 100, 160 and 200 ISO. The back uses a flip out 1.8" color LCD display. 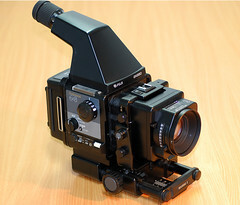 There are many third party manufactures that have created adapters for the GX680 system that allows mounting of digital camera backs made for the Hasselblad, Imacon, Jenoptik, Kodak, Leaf, Mamiya, Phase One, and Sinar systems. This page was last edited on 16 December 2018, at 10:33.